Shapesheets, eh? Many people I speak to have never heard of shapesheets in Microsoft Visio, let alone used them. That’s a shame as they’re kind of useful to manipulate shapes in Visio and automate the behavior of those shapes. It’s possible to take this to a rather sick level of complexity, but having a basic knowledge of using shapesheets turns out to be rather helpful. So, since I’ve had to explain this a couple of times recently and it would be nice to have something on record, here’s a quick guide to using Visio shapesheets to manipulate the textboxes attached to (most) objects in Visio. In Part 1 (this post) I’ll cover some of the underlying terms and concepts required to play with textboxes. 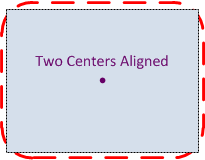 In Part 2 I’ll look at whether the changes discussed can be implemented without touching a shapesheet in the first place, and look at some of the issues that can arise by doing so. In Part 3 I’ll look specifically at how to implement these changes consistently via the ShapeSheet. Not very exciting I agree, but it’s an interesting property of most objects in Visio that you can type text and it will appear within /on top of / around the object, and that the text is “attached” (i.e. it moves with the object). TIP: If you want to edit the text within an object, select it and press F2. I’ve been surprised with how many people don’t know this shortcut – it works almost everywhere in Microsoft software – in Windows Explorer to rename a selected file; in Excel to edit a cell; in PowerPoint to edit object text or text blocks; and so on. It’s particularly valuable because when you have objects grouped, you can click until the correct sub-object is highlighted and use F2 to edit just that component’s text, which can otherwise be almost impossible to get into edit mode. This is our first glance at the ShapeSheet; we’ll look at how to edit it later on, but the similarity to an Excel spreadsheet is uncanny in some respects. 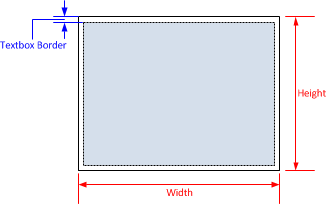 TxtWidth and TxtHeight are the object variables that define the size of the textbox within the square, and they in turn refer to the Width and Height of the parent object (the square). The textbox you will note is handily centered in the middle of the square. This as achieved through the use of two pairs of variables which tend to get confused, so I’ll take a moment to explain them. 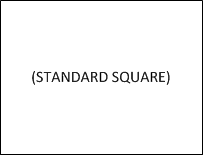 To do this, we will pretend that the square and its textbox are completely separate entities. 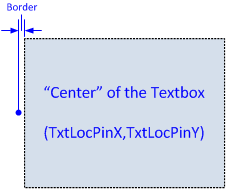 Think of the textbox as being a piece of paper, and the square as a noticeboard to which the paper can be attached. 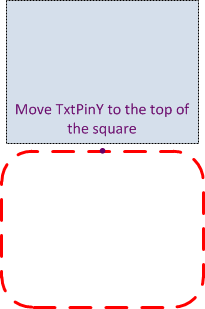 By adjusting the values for TxtPinX and TxtPinY, the dot moves, and the textbox that’s pinned to that dot moves with it. The size of the textbox does not change as it moves. TIP: The coordinate origin (0,0) for the values we are discussing is at the bottom left. 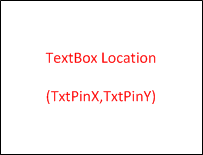 On the left hand side of the diagram above you can see the red pin in its new location, and on the right hand side I have superimposed the textbox as it would be placed. This probably isn’t the most useful place for a textbox; maybe we can move the text all the way outside the square – kind of like a label of sorts? I have two choices here. First, I could try to move the red pin even further to the right (off the noticeboard and on to the wall). TIP: Unlike a real noticeboard, the red dot that the paper gets pinned to can be moved anywhere within the noticeboard – even on to the wall surrounding it. Do not try this at work, or they may get annoyed with the holes in the drywall. 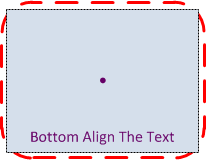 The blue pin shown above is on the true outer edge of the textbox – and that’s what sits over the red pin on the square. So what use is all this? 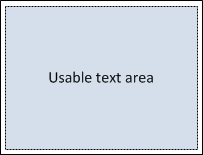 Well firstly, if you are using lots of RETURNs to position text in Visio, chances are you will find life better if you move the textbox around instead. I draw a lot of network diagrams, and one of the things that drives me most crazy is when an object doesn’t have an attached label, but rather it has a textbox added indepedently, and then the two objects are grouped together to make it easier to maintain. This actually makes it harder to maintain, because to edit the label I would have to click the grouped object, then click the label within it to select it, then press F2 to edit it. I’ve seen too many people struggle editing grouped objects to say that it’s a preferred choice. 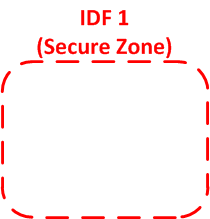 TIP: When you group objects together, Visio creates a new ‘object’ that represents the group. 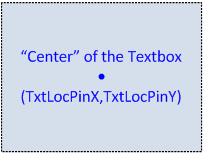 This new group object has the same properties as every other object – including a textbox! 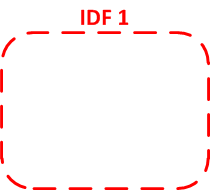 If you click on a grouped object and press F2, you are adding text to the grouped object, not editing the textbox of a shape within the group. Sometimes that’s a desirable behavior, but more often than not, it’s a pain. 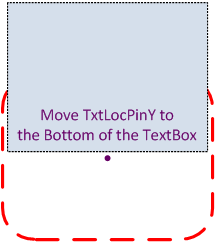 If you are new to moving textboxes around it may be worth taking a moment to see if you can reverse engineer the process to create this shape-with-text. When you’re ready, here’s the solution. And we’re done – a few very simple steps, and now I have a nice object I can use in my diagrams, and best of all, it’s not a square and a textbox grouped together! 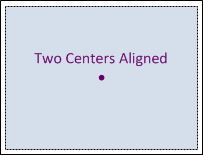 Next time you need to have text attached to an object in Visio, think about whether these kind of changes could help you? Look for the Part 2 and 3 where we’ll dig into more detail and explain how to make the changes demonstrated above. If anything’s unclear or incorrect, please comment and I’ll try my best to clarify. –Edited April 24, 2011 @ 3:20pm to correct TxtLocX/Y to TxtPinX/Y and correct the Origin TIP to “Bottom Left” (late night, that’s my excuse).